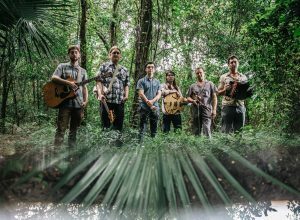 Lost Bayou Ramblers, the perversely progressive band rooted in Cajun traditions, are undertaking a victory lap this Fall, that begins September 7 in Lafayette, Louisiana and ends October 27, 2018 in New Orleans. Afterwards, the group goes on hiatus until April 2019 – their longest break from regular live performing in twenty years. Eric Heigle will finish up producing and mixing records by The Soul Rebels, Lakou Mizik, Motel Radio, and the 79rs Gang, as well as an album of his own original material, and will also be playing drums with bounce artists such as 5th Ward Weebie, PNC, and DJ Jubilee. Eric and Andre will be performing together as Lost Bayou Duo on the “Take Me To The River Tour” in the Fall and Winter of 2018/2019, based around the documentary of same name which LBR is featured in, performing two songs with AniDifranco and Walter Wolfman Washington. Eric and Andre will also be performing as “The Riverbend Ramblers,” along with Andre’s wife Johanna Divine, and aspire to tour as much possible within walking distance to their homes in Uptown New Orleans’ Riverbend neighborhood. In between “Take Me To The River” tour as Lost Bayou Duo with Eric and playing with Riverbend Ramblers in and around New Orleans, Andre Michot will spend time at his workshop in Broussard, catching up on his wait list for accordion repairs and custom-built Michot accordions. When not playing with Louis, Kirkland will be working as part of the Nouveau Electric team… and finally learning French!